Hi everyone! 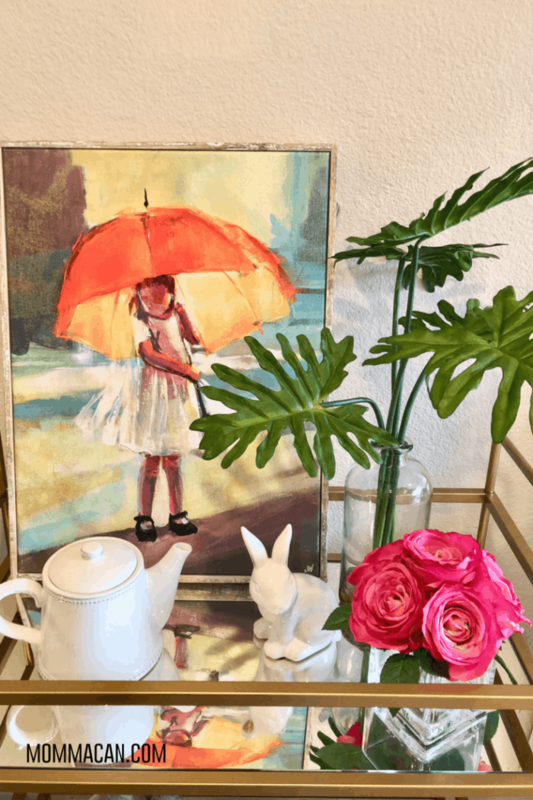 Easter is just around the corner and I am excited to share several Easter Celebration Ideas Adding beautiful color and whimsy to Easter creates an exciting palette to celebrate one of my favorite holidays. Decorating Easter eggs with the kids, creating tasty deviled egg treats, and decorating my new bar cart has made this year’s celebration something to truly look forward to designing and cooking for. A few design blogging friends are helping to share creative ways to celebrate Easter and their posts are here and they are just fantastic! Easter Celebration Ideas from the best design bloggers I know! Easter comes in Spring! Breaking out the cheerful colors, adding tulips and lilies throughout the house, adding silly ceramic bunnies and decorative eggs is just so much fun! Every family has their own unique set of traditions. Our family decorates and hunts real eggs! When I was a girl we had over 20 cousins, it could be more or less depending on our ages. We had so many one Easter that the adults divided us into three age groups. The night before each family decorated a dozen eggs or more per child. We always had extra in case we had children visiting from my Granny’s neighborhood. I looked forward to decorating eggs every single year and even with my kids being older we still decorate the eggs. The smell of vinegar immediately reminds me of Easter! Those colorful fizzing tablets in a glass cup! The little wire egg holder, that never worked! Do you decorate eggs for your Easter Celebration? Need ideas? Check out our Simple Easter Egg Dyeing Party Post here! 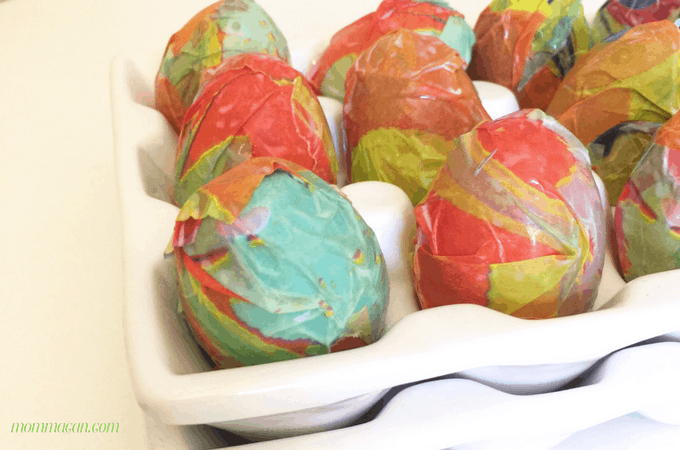 Young children will love creating this simple Decoupage style Easter Egg using strips of tissue paper and white glue. 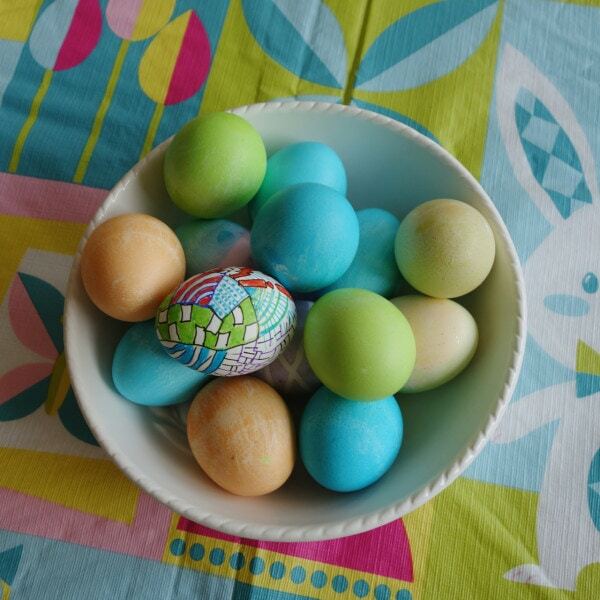 We had a blast creating these colorful eggs. I saved them and am using them in Easter Designs this year! Easter Egg Craft instructions can be found by clicking here. Easter Celebration Ideas should be simple! Our new bar cart is decked out with colorful flowers, bargain Plastic Eggs, and ceramic bunnies. I had so much fun designing the cart! You can do the same with a small table, the fireplace mantel, or a chest of drawers. Creating simple Easter vignettes around the house adds charm and does not break the bank! Learn How to Style an Easter Bar Cart! Creating an artful design using a bar cart is a simple and beautiful way to decorate for Easter, find out how. in Five simple steps. Bonus: Free Printable Easter Menu Planner and a peek at what we are having for Easter Supper! Find the free printable menu planner here! And now… An Easter Blog Hop! Pam, I love all of your ideas! I definitely think that I will try the egg decoupaging with my girls! They will love it, and your eggs turned out so beautifully! Thanks so much for sharing! Your bar cart is amazing! Easter egg decorating was always my favorite thing to do at Easter when I was little and then when my kids were little. Pam this is a really great post, and those decoupage eggs are so pretty. I bet the kids had a blast making them. They just like fun 😃 in some odd way I feel like they match the bar cart art. I think it is colors and watercolor effect. I know, I am going to redo the bottom with the decoupage. I noticed that as well. I loved that crazy tissue paper from Target. Easter is so much fun and it’s so great that you are building memories for your family too. Last year we decorated ours with felt tip pens and they actually turned out really good. Maybe we should try the decoupage this year too as it looks like it would be fun to do.